Staying connected in your relationship can be challenging. Relationships take work and people often settle in and get comfortable and forget to the do the work that’s needed. They start taking each other for granted and expecting their partner will always be there when they finally have time to spend with them. When this happens, a distance begins to grow between you. A long and happy relationship can only happen when both partners are feeling connected, understood, respected, and appreciated by each other. This doesn’t happen overnight and it’s not something that you can work on just once then never again. It takes constant effort from both sides to continue that feeling of connection over the years. Being in a relationship takes work, yet it’s the most important job you’ll ever have. In some ways, being in a relationship is the most difficult thing you will ever do and also the most rewarding. By maintaining your connection with each other, you know you’ll always be with someone who understands you and supports you. Someone who will be there for the good times and the bad. There’s no better feeling in the world. It takes effort to keep the connection alive and well. It can sometimes feel challenging or even tiring to put in the work you need to, yet the relationship will benefit in the long run for the day-to-day efforts you make. If we constantly put our partners down, devalue their opinions and their work, and let them know that nothing they do is good enough, they’re going to disconnect. Try instead to notice all the things your partner is doing well. What you focus on will be the only thing you see. Show them support and encouragement. Find something to compliment them on every day. Make a point to say something positive about them every day. Speak in terms of love and endearment instead of a simple and generic “hey.” When you speak with respect and kindness, you will find the foundation of your relationship begin to grow stronger. We don’t always have good days or days we feel confident and secure, however, if our partners remind us of how much we’re loved every day, it makes everything else okay and makes the relationship stronger. Show your partner they’re appreciated during all the ordinary moments. Recognize their positive aspects and express your gratitude for everything they do in a positive way. When you see them doing something helpful or thoughtful, be sure to tell them. Let them know their efforts are noticed and appreciated. So often we feel taken for granted because our partners begin to expect certain things of us and they forget to say those two magic words, “thank you.” Letting your partner know, on a daily basis, how much you appreciate all they do for you and your family is important. If you’re not receiving the appreciation you think you deserve, offer what you are not receiving by showing more appreciation for your partner. Let them learn by example. Gently remind them from time-to-time that you need to feel appreciated. Most of the time, partners get so comfortable in a relationship they forget what they have and need. It’s ok to give a gentle reminder. The success of your relationship can be determined by the way you handle problems together when they occur. Bring up issues at a neutral time, in a gentle way, without criticism, defensiveness, or anger. Listen openly to your partner’s response without wanting to reply just really listen. Work to find a solution or compromise together. Show each other respect and work through the problem together. It will strengthen your relationship. Addressing a problem with anger or criticism will only widen a distance between you. These basic ground rules for problem-solving will make it easier for you both to bounce back quickly. 4. Make time together a priority. When your partner feels like they are a priority in your life, it will strengthen the bond between you. In a study by the University of Virginia, researchers found that time spent alone with your significant other (talking or sharing an activity) has a significant impact on the success of your relationship. Couples who scheduled time together at least once a week were three times more likely to be happier in their relationship than couples who didn’t. Researchers also found that those who rarely had couple time had almost double the probability of divorce. Make each other a priority and schedule alone time on a regular basis. Make sure that time is spent distraction free. Give your partner your full attention by putting the cell phone down, looking into each other’s eyes, and talking. Get connected to each other deeply again. Life is busy and we’re all on the go from the time we wake up until the time we crawl back in bed at night. It can be so easy to miss a moment of connection with your partner throughout the day. A “quick connect” is a way to connect with your partner even when you’re busy or not together. Leave a love note next to your partner’s coffee cup or in their lunch bag, pack a card with a loving note in the suitcase before a trip, offer a hug or a quick shoulder rub at the end of a long and tiring day. Little moments like these add up to long-term happiness and a feeling of connection. 6. Stop wanting to fix everything. Many relationships have one person who is the “fixer,” the one who listens to problems to try and find the solution or a way to take care of it for their loved one. Sometimes, all we really want is to be heard and say something out loud so that we can work through to a solution on our own. If this arises tell your partner you just need to “throw up” about the situation and you don’t need a solution to the problem. If you are the “fixer” take a different approach instead of listening to “fix,” work on listening to just be a dedicated listener. Ask a few questions for clarification purposes and to show you’re truly paying attention yet stop offering advice unless your partner asks for it. We often fall into the same routines; going to dinner at the same restaurants, traveling to the same vacation spots, doing the same weekend activities. Keep things fresh and look for new adventures and experiences to enjoy together. Explore at least one new restaurant a month, take a mountain vacation instead of a beach vacation, find a new activity every weekend, take up a new hobby or sign up for a cooking class together. Break out of the same boring routine to do something different every once in a while. Whether it’s a big win or a small victory, show your partner how excited you are for them by celebrating their successes. Congratulate them, celebrate with a special dinner or a glass of wine. Let them know how happy you are for their accomplishment. We tend to only celebrate the big events, yet the small victories happen far more often and they’re worth celebrating too. Show your partner you support their efforts and you’re excited about them for their accomplishments. Knowing they have support and someone who’s happy for them at home will bring you both closer together. 9. Spend time with each other’s friends. It’s fine for you and your partner to have your own friends that you like to spend time with on your own, yet it’s important to include your partner in those friendships from time to time. Get together for a couple’s dinner or invite your friend to your house for a glass of wine instead of meeting them out somewhere so your partner can at least say hello. The more you intermingle with each other’s friends, the closer you’ll become and the less threatened you’ll feel when your partner wants to spend time with a friend. Having a memory or sharing a laugh that only the two of you remember creates a sort of “secret club” that only you belong to. It increases your connection to each other and helps you to feel more satisfied in your relationship. When people laugh and share memories together, it validates their opinions and feelings. Special pet names fall into this category too. Having a pet name for your partner that only the two of you understand creates a strong connection just between you two. Staying connected to your partner on a regular basis can be challenging in these times of busy schedules and endless distractions. The most important thing to remember is to make your relationship a top priority in everything you do and how you live your daily life. 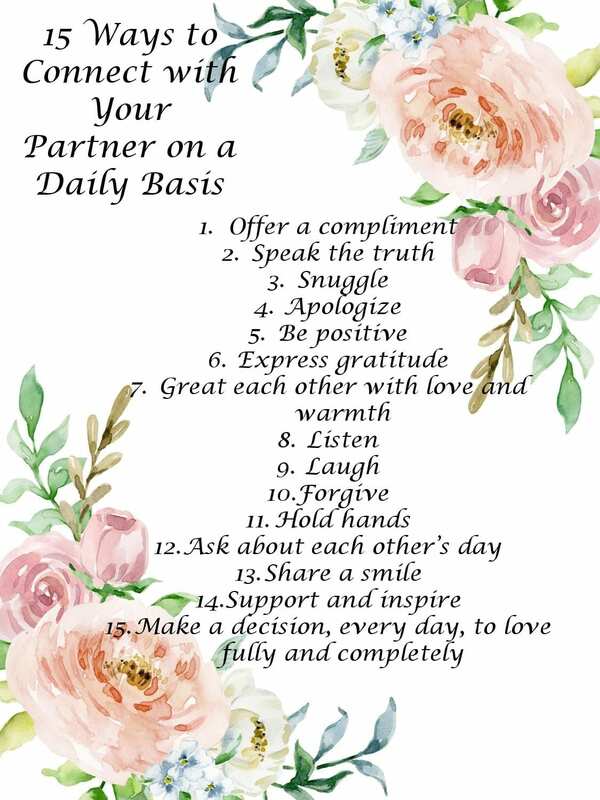 Doing so will help you do and say all the right things to strengthen your relationship and create an unbreakable bond between you. What will you do today or this weekend to strengthen your relationship and reconnect with your partner?